LEIGH, a town, a township, a parish, a sub-district, and a district, in Lancashire. The town stands on the Leigh and Wigan canal, on a loop-line of railway, from Tyldesley to Bradshaw-Leach, and near the Bolton and Kenyon branch of the Northwestern railway, 7¼ miles SW by S of Bolton; comprises portions of West Leigh, Pennington, Bedford, and Atherton townships; has undergone much improvement, under the Local Government act of 1858, and under the Public Works Manufacturing Districts act of 1863; is a seat of petty sessions and county courts, and a polling place; publishes a weekly newspaper; and has a post office under Manchester, two railway stations with telegraph, a bankingoffice, a market-place, a town hall, gas-works, three churches, four dissenting chapels, a Roman Catholic chapel, a grammar school, two national schools, a British school, a public cemetery, and charities £339. There are large cotton factories, foundries, malting establishments, two breweries, and three corn mills. Pop. of the town in 1851, 5,206; in 1861, 10,621. Houses, 2,098. Pop. in 1851, of the West Leigh portion, 838; of the Pennington portion, 4,496; of the Bedford portion, 4,885. Leigh library have a couple of film readers, a couple of fiche readers and a helpful local historian. I would advise booking in advance. They also carry electoral rolls and local history books of the area. Details about the census records, and indexes for Leigh. You can also perform a more selective search for churches in the Leigh area or see them printed on a map. 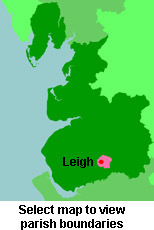 The Register Office covering the Leigh area is Wigan and Leigh. Ask for a calculation of the distance from Leigh to another place. "LEIGH, a parish and market town in the hundred of West Derby, county Lancaster, 7 miles S. of Bolton, 15 from Manchester, and 193¼ from London. It has two stations --one at Leigh, the other at Atherton, on the Bolton and Kenyon branch of the London and North-Western railway. The parish is situated in the S. parliamentary division of the county, and is intersected by the Wigan and Leigh branch of the Leeds and Bridgwater canal. It is of large extent, comprising the townships of Astley, Atherton, Bedford, Pennington, and West Leigh, which two last form the town of Leigh. The growth of this town has been extremely rapid, the population having more than doubled in the decennial period from 1851 to 1861: at the former census the inhabitants were returned at 5,206, and at the latter at 10,621. The streets are regularly laid out, and most of the houses of recent erection. The town is well paved, and lighted with gas. The principal public institutions are the townhall, erected in 1840; union poorhouse; offices of the Warrington division of the county constabulary, which has its head-quarters here; a mechanics' institute, with library containing 1,200 volumes, established in 1842; a branch bank; market-place; new cemetery, opened in October, 1856, for the rest of the parish, except the township of Atherton, which has a cemetery of its own, formed in 1857. There are also extensive silk and cotton factories, maltings, corn-mills, a brewery, andiron foundries; and, in the adjoining township of Atherton, establishments for the manufacture of nails and bolts. One weekly newspaper, the Leigh Chronicle, is published in the town on Saturday. In the vicinity of the town are collieries, stone quarries, and brickfields. The soil is clayey, on a subsoil of sandstone. The chief crops are wheat, oats, potatoes, and in the township of Atherton grass and vegetables. The living is a vicarage in the diocese of Manchester, value £263. The parish church, dedicated to St. Mary, is an ancient stone structure, with a tower and two mortuary chapels attached. There is also a chapel-of-ease at West Leigh, erected in 1855. There are district churches at Astley, Atherton, Bedford, and Pennington, the livings of all which are perpetual curacies, varying in value from £100 to £250. The church of St.
ENG-LAN-LEIGH is an e-mail list for Leigh genealogy. In 1835 the parish of Leigh contained the townships of Atherton, Tyldesley with Shakerley, Westleigh, Pennington, Bedford and Astley. You can see the administrative areas in which Leigh has been placed at times in the past. Select one to see a link to a map of that particular area. View maps of Leigh and places within its boundaries. The Workhouse site has an interesting description of Leigh workhouse. For probate purposes prior to 1858, Leigh was in the Archdeaconry of Chester, in the Diocese of Chester. The original Lancashire wills for the Archdeaconry of Chester are held at the Lancashire Record Office.